Frontline Spot-on XL Dog 40-60kg is for the treatment and prevention of flea and tick infestations in dogs. Frontline Spot-On Dog 40-60kg - 6 Pack is a Prescription Only Veterinary Medicine and by law requires a prescription from your vet. 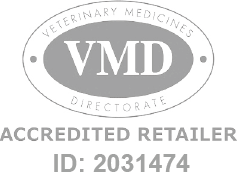 Frontline Spot-on XL Dog 40-60kg is for the treatment and prevention of flea and tick infestations in dogs and as part of a treatment strategy for flea allergy dermatitis where this has been previously diagnosed by a veterinary surgeon. Also for the control of infestations of biting lice on dogs. Frontline Spot-on XL Dog contains Fipronil 402mg Easy to use pipette containing 4.02ml solution to be applied topically to the skin on the back of the neck 1 pipette per 40-60kg bodyweight For the treatment and prevention of fleas use every two months. For the treatment and prevention of ticks, and if part of treatment for flea allergy dermatitis use every 4 weeks. Can be used in puppies over the age of 8 weeks/and or weighing over 2kg.